The body takes in nutrients and uses the energy from it to supply the different processes of metabolism. In turn, the individual cells produce waste products that need to go out of the body. One of the major by products of metabolism is the urea and creatinine. You need to eliminate these two from your blood through the help of the kidneys. If you are to study the kidneys microscopically, you will find tiny structures called the nephrons. The nephrons are the functional units of the kidneys. To understand how your body eliminates the unwanted and excess substances, you have to understand the anatomy of the nephron and its function. The renal corpuscle is the primary area of blood filtration. It consists of the glomerulus and the bowman’s capsule. The glomerulus is the ball of coiled capillaries that receives blood from the afferent arteriole and brings back the blood cells to the circulation through the efferent arteriole. While passing through the glomerulus, some of the low molecular weight substances in the blood, like water and electrolytes, are filtered in the bowman’s capsule. Due to the thin lining of the structure and the fenestrations present, the plasma enters the renal tubules. However, the blood cells move to the efferent arteriole at once because they are too large to pass through the bowman’s capsule. The renal tubule is the next structure in the nephron that receives the filtered plasma from the renal corpuscle. It consists of three parts: the proximal convoluted tubule, the loop of henle and the distal convoluted tubule. Surrounding the renal tubules are the peritubular capillaries. Because not all of the filtered substances must reach the urinary bladder for elimination, many of the essential substances are reabsorbed back in the renal tubules through active and passive transport. Water and urea undergo passive transportation whereas glucose, amino acids and some salts go through active transport. Because some too-large waste products escape the bowman’s capsule, they need to be eliminated in another form. To eliminate them, the renal tubule functions in the tubular secretion. While the filtered blood is passing through the peritubular capillaries surrounding the renal tubules, exchanges of materials also occur. The renal tubule works to eliminate not only the unfiltered waste products, but also to maintain the acid-base balance in the body as well. 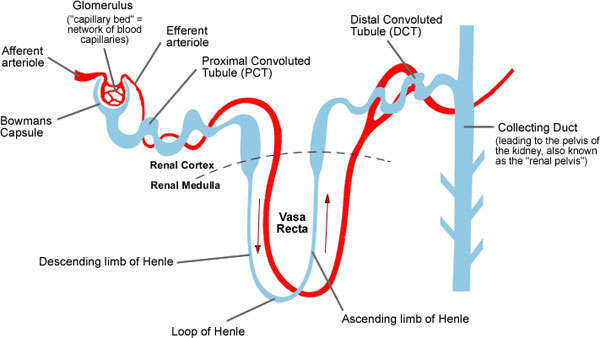 Because the body does not have to eliminate the whole plasma volume, the final concentration of the urine starts in the descending and ascending loops of henle. Because of the differences in the osmotic gradient, substances re-enter the circulation, leaving only a few parts to become the final urine. Hormones affect the formation of urine in the nephron. One hormone greatly affecting the urine volume is the vasopressin, or also known as the antidiuretic hormone (ADH). An increase in this hormone leads to decreased urine output. The nephrons are tiny structures but they perform a major function. If you cause a damage in them, toxic wastes will start to accumulate and the condition can be life threatening.